Chutneys originated in India – the name derived from the Hindu word chatni . They then came back to Britain with explorers where they were a hit and are now a very popular preserve all over the world. The scope of chutneys is endless and the combinations and permutations can be varied according to personal taste and the ingredients available. They can be sweet or sour, hot or mild and the range of ingredients is almost unlimited as well. They can be made from fruits or vegetables, or a mixture of the two. Better still, because the ingredients are going to be chopped, cooked, mixed with spices, vinegar and other ingredients and often reduced to a smooth pulp, you don’t have to be fussy about the quality of the fruits and vegetables. Misshapen or damaged fruits can be used. They’re good for using up end of season produce as well. Windfall apples, green tomatoes and the last of the rhubarb can all be converted into an appetising chutney. To the chutney’s base ingredients you add various spices and other fruits like raisins, sultanas, dates and vegetables such as onion and garlic for the flavour. The vinegars, sugar and salt are there not just for the flavour but they are also the preservative. Although we tend to think of chutney as a condiment such as mango chutney with a curry for example, they can provide a substantial portion of a meal. One point to bear in mind is that the flavour of a chutney improves with age. 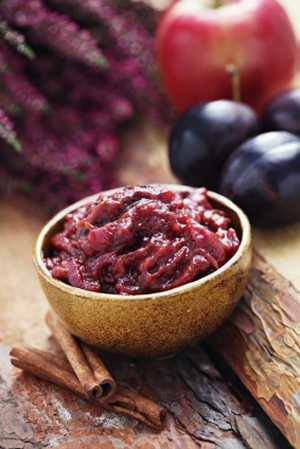 Most chutneys take at least a couple of months for the full flavour to develop and mature. Personally, we would never even try one of our chutneys until it has sat for three months maturing. A big advantage to both fruit and vegetable chutneys is that they improve with age and, if properly stored, will remain in good condition for a number of years. Do use your common sense though, if you open a jar and it smells strange or off or has mould on it, don’t risk it eating it. If you are set up for making jam, then you are nearly there for making chutneys. There are a few things to remember though. The pan should be large, a preserving pan is best, but not made of a material that will react to the acidic vinegars and give a metallic taste to the final product. Stainless steel or enamel lined pans are fine but not copper, aluminium or cast iron. You will need a long handled wooden spoon but here you are best to keep it just for chutney as it will absorb some of the spices so it could taint other things like a jam with an unwanted spiciness. Chopping boards and a stainless steel knife are essential, as is a sieve – stainless steel or nylon . The jars are important, for small quantities jam jars are fine but for larger quantities you will find a larger sized jar more convenient. We find the Kilner style jars best although ours are the French Le Parfait brand that are available widely. Second hand shops, car boot sales and bring and buys can be a good source of preserving jars. Discard any jars with chips or cracks to the recycling bin. If the rubber seal is looking perished, you can buy those separately from a number of online suppliers. With ordinary jars, the covers are most important. Vinegar corrodes metal, so use plastic screw or snap-on types or the metal ones coated inside with a plastic preserving skin. If you look at a commercial jar of pickle, like Branston, you’ll see the type of lid I mean. Glass lids as in the preserving jars are fine, of course. You can use ordinary granulated or brown sugar as you wish. Brown sugar gives a darker colour to the chutney that is often preferred. Prolonged cooking of any sugar does, however, have a darkening effect on the chutney and, if a lighter colour is wanted, the sugar should only be added when the fruit and/or vegetables are already soft and mushy. Generally whole spices are preferable in chutney-making than ground ones, which can give a muddy appearance to the chutney, although it doesn’t make a lot of difference, if any with dark coloured chutneys.